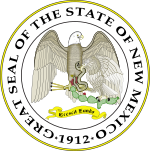 The New Mexico gubernatorial election of 2002 was a race for the Governor of New Mexico. The winner of the election held on November 5, 2002, served from January 1, 2003 until January 1, 2007. Current incumbent, Republican Gary Johnson was term limited. Former U.S. Congressman Bill Richardson won the election. Green Party nominee David Bacon received over 5% of the total vote, including over 11% in Santa Fe County, which was his best showing.